Download Bangla Translated Book. The Runway Jury by John Grisham is a legal thriller novel and the writer is an American author. This book was Grisham’s seventh novel. This book was first published in 1996. ‘Wendall Rohr’ and a legal team of successful lawyers have filed their promise on behalf of ‘plaintiff Celeste Wood’, whose husband died of the lung cancer. The fight is to be held in Biloxi between a tort lawyer and sympathetic juries. The defendant is a tobacco company. The sympathetic jury has been sworn to say the truth and Nicholas Easter, has begun to quietly connive behind the scenes and the attention was with a mysterious woman known as Marlee. The main character in this novel is Wendall Rohr who is a successful tort lawyer. He tried the case in his home. The second main character is Durwood Cable who is the defense lawyer. The third main character of this novel is Rankin Fitch who is a consultant for the big tobacco companies. There are also some important characters such as Nicolas Easter, Marlee, Frederick Harkin, Loire en Duke, Angel Weese, Lonnie Shaver, Stealla Hulic, Frank Herrera etc. 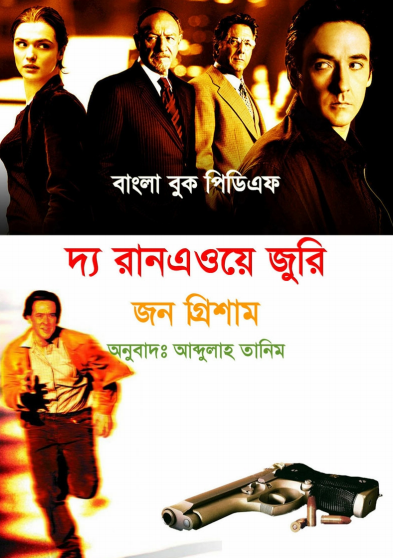 If you want to read and check out the test of Bangla translation book named The Runaway Jury by John Grisham, you need to download it first. To download, you are requested to click here!